What if we all read the same book? 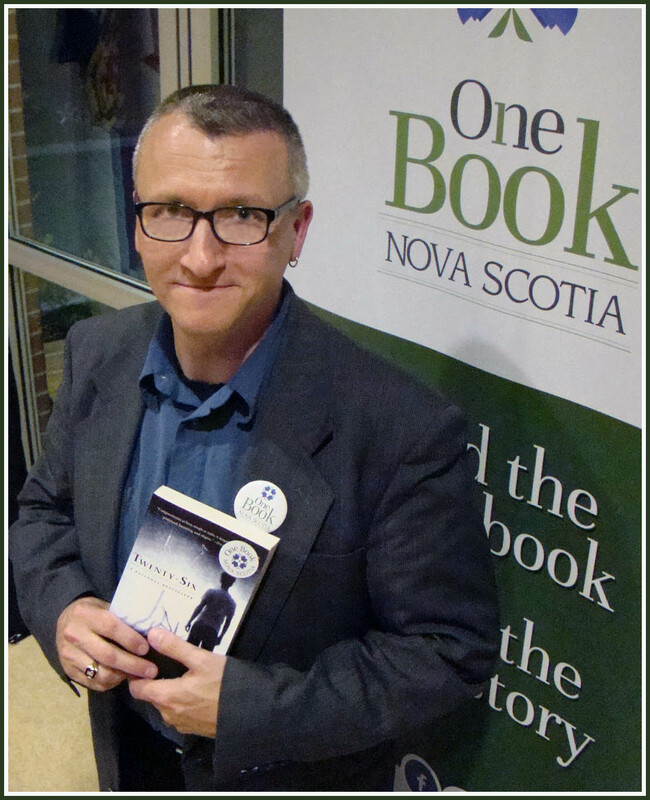 Over 1,100 Nova Scotians took the One Book Nova Scotia challenge this fall and participated in Nova Scotia's first ever community reading event for adults. Community reading events take place all across North America in an effort to encourage reading and create connections among community members. On September 21st the title Twenty-six by Leo McKay, Jr was announced as the book all Nova Scotians should read. A fictional novel based on the 1992 Westray mining disaster, it seemed an appropriate choice for the 20th anniversary of this tragic event. People borrowed, downloaded, and bought the book enthusiastically. During the seven week duration of the program, 802 people borrowed copies of the book from public libraries, and an additional 246 borrowed from community college and/or university libraries. Currently there are still 284 people on waiting lists in public libraries to read the book. On top of that, 120 copies of the ebook were downloaded, with 56 more people still waiting for their turn. Lots of people also got to meet the author. 457 people across the province attended fourteen author readings, most of which were funded by the Canada Council for the Arts. Several bookclubs read the book this fall and the Annapolis Valley Regional Library has a "Book Club in a Bag" kit for clubs to use. Given the success of this year, you can bet that One Book Nova Scotia will become an annual event. What book will it be for 2013? Stay tuned to find out! Submitted by Frances Newman, Regional Librarian & Chair of the One Book Nova Scotia steering committee. "12 Days of Cookies" Returns! Because we had so much fun with this last year, we are doing it again! The 12 Days of Cookies will return on December 3. For twelve days, we will bake cookies, post our recipes, and share them at our library branches! Watch this space, follow us on Twitter @valleylibs, or check in on Facebook to see the cookies each day and which branch will have the cookies. Last year we found some great new recipes, and this year will likely unearth some sweet treats as well. Want to join in on our 12 Days of Cookies? Here's how you can participate, and maybe even win a gift card! Bake a cookie recipe from a book you borrowed from the library, send us the book title and a picture of your cookies, and you’ll be entered into a random draw for gift cards. Selected entries will be posted on our 12 Days of Cookies blog page. All complete entries will be entered into the draw. Please use the subject “12 Cookies” or your entry may appear as spam. 4) Your name, email address, town you live in, and phone number, in case you win! 5) All entries must be received by midnight on December 18, 2012. You may send more than one entry, but your name will be entered only once. By entering you agree that if your cookies are chosen to appear on our blog page, you allow your first name and town to be posted along with the entry. Personal information will not be used for any purpose other than this contest. Are you tired of searching the Internet for information, getting ads and pop-up windows, or getting information, but you don't know who it is actually from? We have a solution for you. Try one of our information databases, these hidden gems are worth uncovering. Go to the Search Databases & More link here. Access to these resources is FREE with your library card from anywhere with an Internet connection!! CPI.Q (Canadian Periodicals Index Quarterly), the award-winning full-text Canadian reference solution, is specifically designed to provide instant access to the most requested Canadian reference materials. Some features include, indexing of more than 1,300 Canadian periodicals (English and French) with more than 700 in full text; backfile from 1980 to present; user-friendly, bilingual interface; more than 130 newspapers including the Toronto Star and The Globe and Mail and much more. Health & Wellness Resource Center, provides authoritative, up-to-date information on health topics for virtually anyone seeking health-related information. This easy-to-use database features top-searched conditions, topics in the news and health videos; detailed coverage of alternative and complementary medical practices; more than 1,000 top medical journals and periodicals as well as articles from more than 2,200 general interest publications; medical newspapers, newsletters and news feeds; full-text reference works such as The Gale Encyclopedia of Medicine, The Gale Encyclopedia of Surgery and Medical Tests, The Gale Encyclopedia of Alternative Medicine and many more. General Reference Center Gold, has the full-text and image resources students and researchers need. The content includes more than 5,700 titles, of which, more than 4,400 are available in full-text. Use this resource to locate articles on current events, business and industry trends, arts and sciences, popular culture, sports, hobbies and more. Resources available include 25 years of backfiles; podcasts from sources such as National Public Radio, Science@NASA, Headline News and NRO Radio; links to more than 5,000 video files includes television shows like the Today Show, NBC Nightly News, NRO TV and Meet the Press; major newspapers, such as The New York Times, Christian Science Monitor and many more; hundreds of children's magazines; and much, much more. Find a journal of interest and then read all of the articles within a specific issue. Remember, it's FREE and it is authoritative, so get your library card out and give it a try. Attention all book lovers! Have you been looking for book suggestions, lists, reviews or just want to browse book covers? Look no further. Goodreads has all of this and more. Part book site, part social network, it has been consistently one of my favourite places for book information. It boasts authors, librarians and a good chunk of the reading public among its huge fan base. Goodreads authors give us a glimpse of what they are reading themselves, what they think of it and also post links to their blogs and pages. Find your favourite and check it out. There are often live chats with authors and opportunities to win new releases. Book trivia, quizzes and author quotes are some of the other bonuses to this site. Even non-member authors get in on the action by posting links to their sites. This is simply the most wonderful place to look for books, being searchable by title, author and ISBN, or just browse the covers on the featured lists. All the editions are listed so you can find out what format your book has been published in. There is a read-alike feature that lets you enter books you have enjoyed and get recommendations for new ones to discover. One of the features, Listopia , has countless lists, everything from Best Mystery and Crime to Books an 11 yr Old Girl Would Like. Most of the features on Goodreads are available for both members and non-members, so don't feel like you have to become a member to take advantage of this site. If you do choose to be a member of Goodreads you start with your own book shelf so you can create lists of books you want to read, rate what you have read and share what you are reading. I find it very helpful when browsing covers and lists to be able to add the book to my "to read" shelf for future reference. There is also a Book Challenge spot for you to set your own reading goals. There are options for more shelves like books to re-read. You can be as social as you want to be. You can just use the features for yourself and your own shelf or over time choose friends that you want to share book information with. Join online book clubs or link to Facebook and Twitter to share what you are reading or find out what someone else is reading and how the book was rated between you. The Goodreads app is available for iPhone, iPad and Android. Curious about this book site? Take the tour !